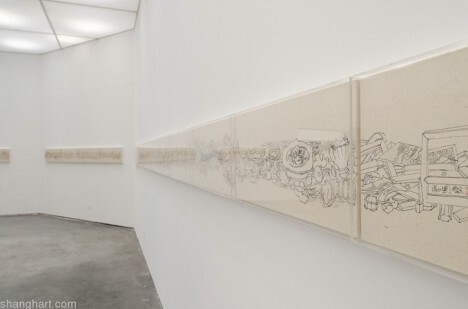 The solo exhibition “The Rhyme of Ruins” by Tang Guo open at ShanghART Gallery. Capturing ghosts in those spaces and painterly fixing them on paper is a constant work over the years. The ghosts span a wide range, varying from pottery to porcelain, from seating to bedding, from farmyard to study and desk, from bracket set to beam frame. As well as basket, bucket, pavilion, porch, tea pot, bowl, dish, jar, flower, and rockery. Be it practical or not, for man or for god, rough or delicate, rare or rotten. A sense of paleness asserts itself by virtue of passion piled by civilization and bone shards from frenzy scenes.